We got the opportunity to step inside Jaclyn James’ gorgeous San Diego kitchen and we were awestruck by the personal touches and one-of-kind DIY projects we saw throughout her modern farmhouse kitchen and living room. One of our favorite aspects of her charming home is that she sourced most of her furniture and decor from local San Diego vendors or built it herself! It is no secret that she has mastered the art of the DIY home project. 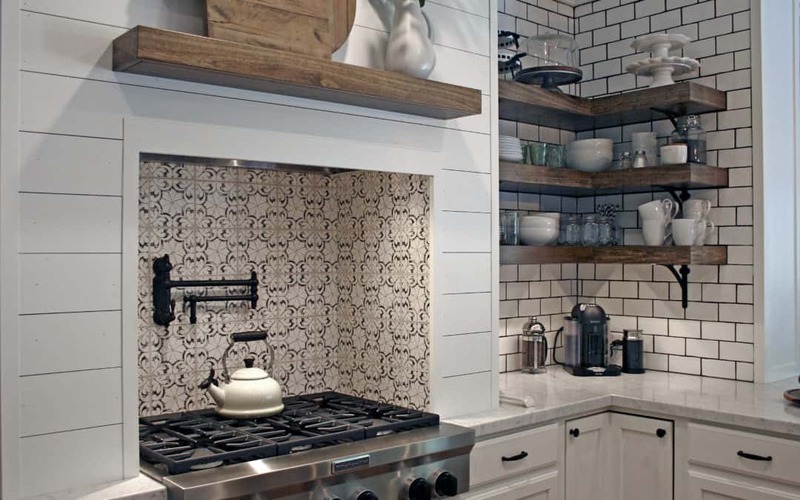 The Oasis Collection on 6×6 Limestone was used as the tile backsplash above her range. This pattern was inspired by watercolor paints and classic Portuguese silhouettes. 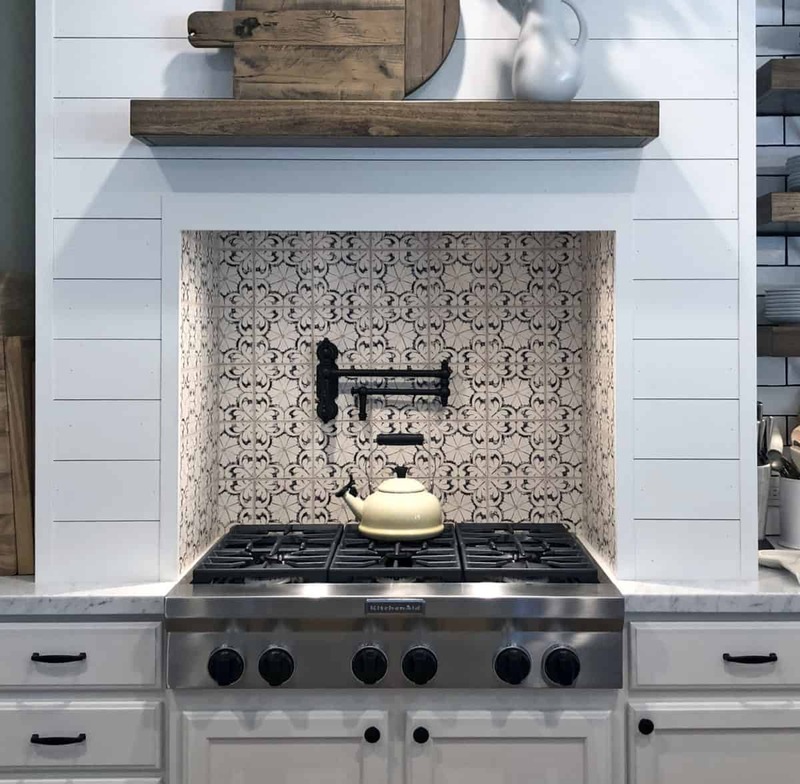 This floral design looks antiqued yet contemporary and looks stunning in this kitchen backsplash. Oasis is a part of our quick-ship line, Artisan Stone Tile, and available to ship within a few days. This tile is offered on a 6×6 or 12×12 honed Carrara or Limestone and in three color options. 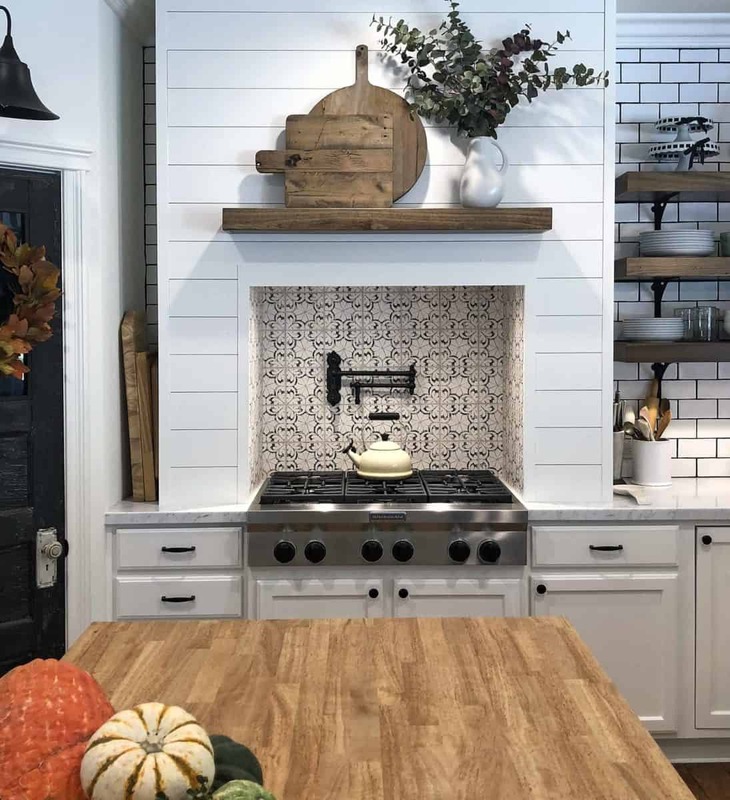 One thing that really makes Jaclyn’s modern farmhouse kitchen so special is the unique pieces she creates herself like the cutting boards on the mantel. She says that she likes to create her own decor instead of buying mass produced items that can be seen everywhere. 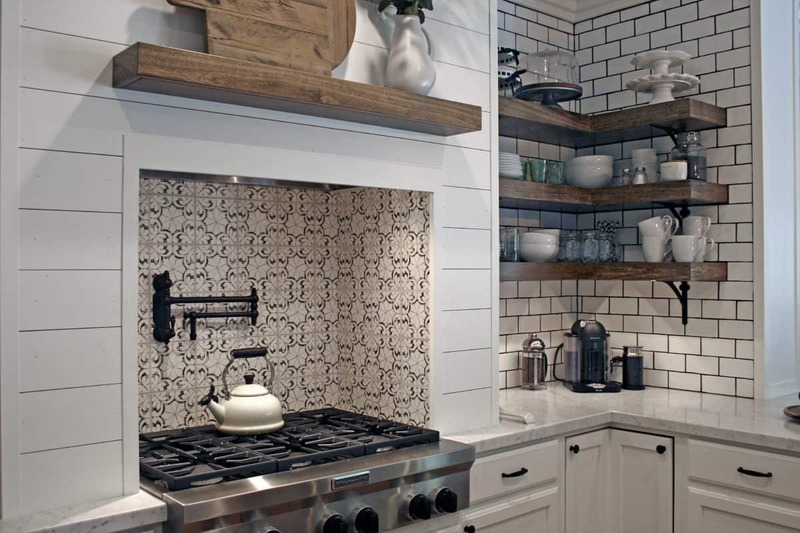 The tile, oven vent, and wood ledges were all sourced through local San Diego manufactures. 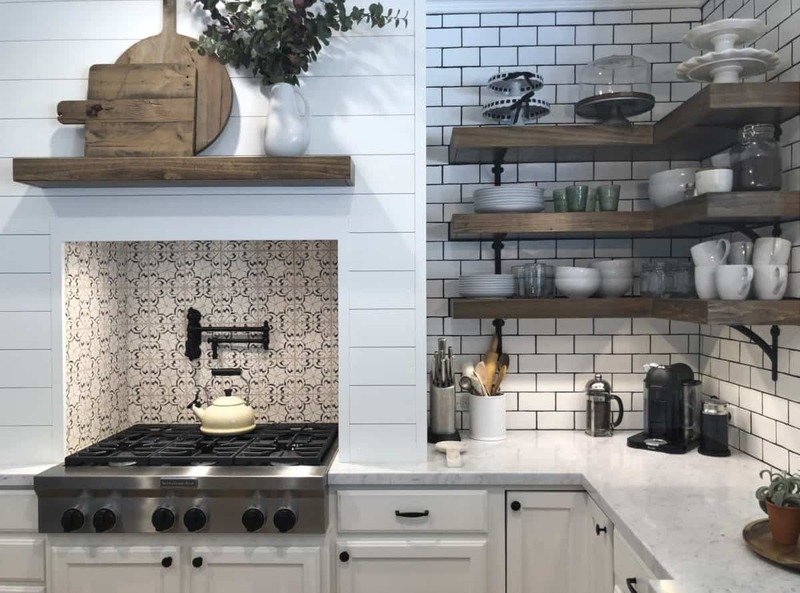 She uses open-shelving for all of her coffee mugs and bowls which fit perfectly into the aesthetic of this modern farmhouse kitchen. The stained wood contrasts beautifully with the white subway tile and compliments the warmth of the limestone. Jaclyn decided to go with the Oasis pattern on beige Limestone as a pop of color. 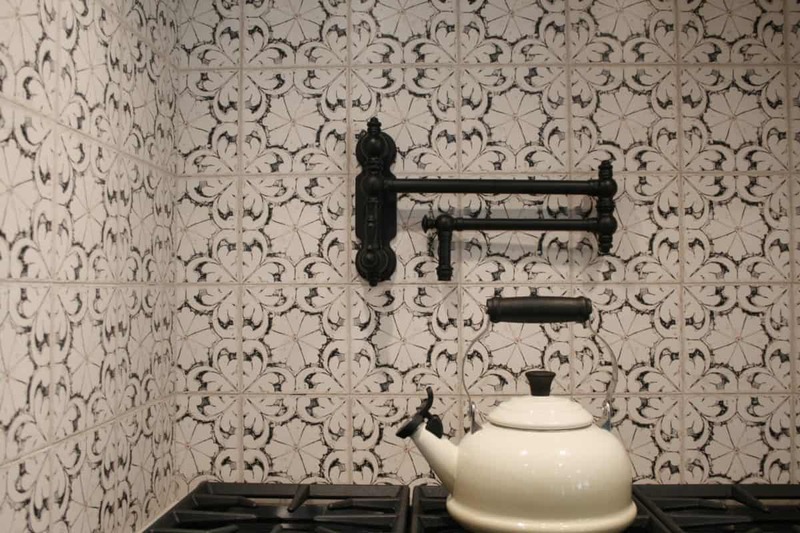 She used a dark grout to tie in the black tones of the decorative patterned tiles with the surrounding field tile. 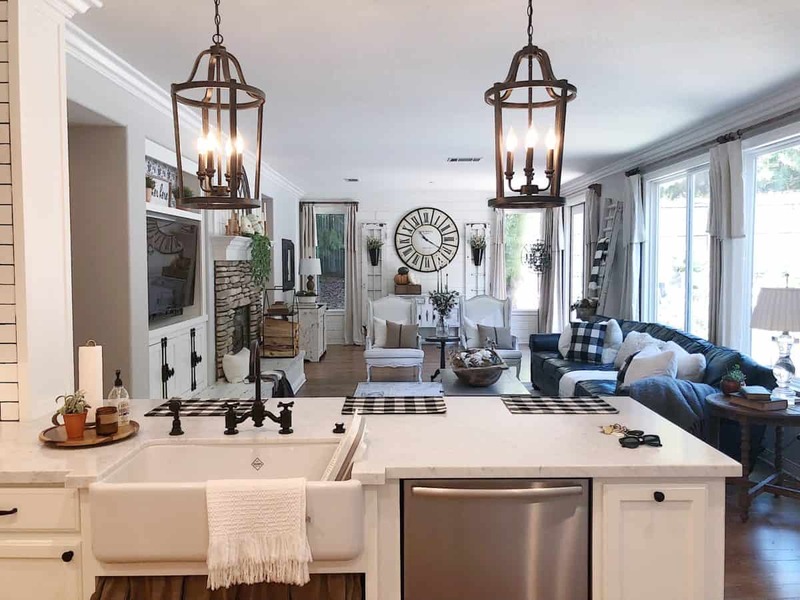 Here is a look into her open concept living room which boasts antiques from local San Diego vendors. Jaclyn says that she likes supporting smaller, local businesses like antique and vintage stores for her furniture. 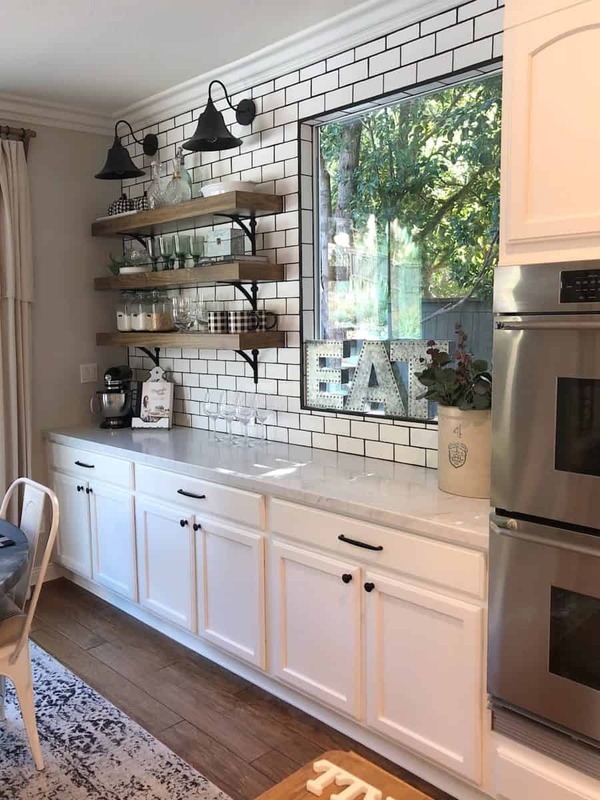 Jaclyn drew inspiration from Magnolia’s Joanna Gaines modern farmhouse style with this corner of the kitchen. She uses open-shelving and modern farmhouse pendant lighting to create a cohesive style throughout the kitchen. I lost my home in the October fires in Santa Rosa and we are rebuilding our home. I have Bianca Drift quartz picked out for my kitchen counters and mocha stained cabinets (a medium brown). I really love the landscape mural designs and the wine designs. Which design will work best to incorporate my Cabinets and countertops. It’s tough working with grey and brown since everyone is focusing on grey and white.